I’m now over halfway through the PhD and so far I’ve been using my time to explore different ideas and processes which, although loosely related to my topic, still feel quite disparate in approach. 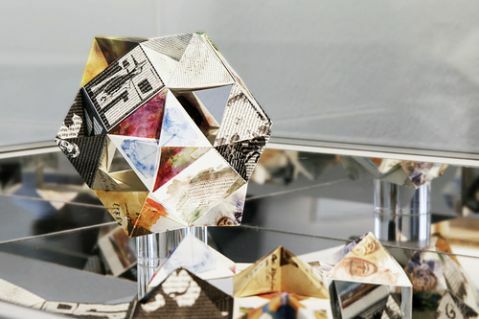 The common thread running through my work appears to be a self-reflexive, analytical practice incorporating auto-ethnographic writing, curatorial projects and the production of interpretive art objects. After a brief meeting with my supervisor, he suggested that there might be some correlations with the work of Marilyn Strathern, particularly in her work on partial connections and decomposition. Marilyn Strathern, a British feminist anthropologist, is a key proponent of Actor-Network Theory, a theory which explores the relationship of human and nonhuman ‘actors’ within networks and systems. This term is also referred to as material-semiotics, where physical actants work together to produce meaning. I was first introduced to ANT through the work of Bruno Latour in his 1993 book, We Have Never Been Modern, and John Law’s 2002 essay, Objects and Spaces, which can be described respectively as Actor-Network Theory and After Network Theory. The distance between these two works is critical, as the latter attempts to revise previous assumptions of the necessity of stable networks as well as criticisms of ANT as ‘amoral’ and ‘levelling’. However, despite its limitations, I found this method to be a useful starting point in understanding my writing and curatorial practice. To return to the work of Marilyn Strathern in relation to my recent project ‘The Imaginary Museum’, I will consider her essay The Decomposition of an Event, along with Planet M, a study of Strathern’s use of comparison, which is authored by Martin Holbraad and Morten Axel Pederson. The Decomposition of an Event explores the meeting of the Hagen – Papua New Guinea Highlanders – and their Australian visitors. The Australians, first regarded as spirits, became human in the eyes of the Hagen after exchanging pearl shells with them. As Strathern describes “they were recognizable as human because they contained within them the capacity to transact” (Strathern, 1992). This analytical process by the Hagen is what Strathern refers to as ‘decomposition’, ie. “taking apart an image to see/make visible what insides it contains; that this is a process that gives the elicitors of those insides, the decomposers, power as witnesses to their own efforts of elucidation; that the elicitor/witness is in a crucial sense the ‘creator’ of the image” (Holbraad and Pederson, 2009). In artistic terms, this could be read as the work of art requiring the participation or ‘witnessing’ of the audience to be complete. This process of exchange echoes previous relational attributes of ANT, whereby transactions are continuously performed within the network. This is reiterated within the audience participation of The Imaginary Museum. Through involving the audience in producing their own collection of the work, the participant transacts with the hitherto invisible artists, making the image ‘human’. By leaving donations in return for the Imaginary Museum postcards, the audience also changes from perceiver to patron, creating further bonds between themselves and the contributing artist(s). The use of collections in my work also resonates with Strathern’s work on partial connections. In ‘Planet M: The intense abstraction of Marilyn Strathern’, Holbraad and Pedersen discuss Strathern’s consideration of the post-plural nature of things: “Everything, one would conclude, is both more and less than itself. ‘More’ because what looks like a ‘thing’ in the pluralist metaphysic turns out, post-plurally, to be composed of further things – inﬁnity inward – and ‘less’ because at the same time it too contributes to the composition of further things – inﬁnity outward”(Holbraad and Pederson, 2009). This post-structuralist method of enquiry is also of interest to my curatorial projects, as by using Strathern’s method of Partial Connections, we can conclude that each image in The Imaginary Museum is both more and less than itself. That is to say that each image contributes to the whole collection – the artist responds to the brief on the basis that the image will be in the company of other images which constitute a plural definition of the term “museum” (less). However, individually each image is also composed of museums and archives distilled into a single frame (more). In other words, each image refers to the notion of ordering, whilst itself becoming the subject of further classification. In thinking about producing reproduction images on postcards (from week 76) and the Andre Malraux research from my previous exhibition The Imaginary Museum, I thought it might be useful to consider some of the processes involved throughout the history of photography. I enrolled on a day course to explore the early photography technique cyanotype, to see if it was something that I could apply to my book making practice. The cyanotype process was mostly used as a cheap proofing process or in architectural designs, hence the name blueprint. However, in the 1960s artists began to revive this medium to explore the creative possibilities of alternative photographic processes. Similar in technique to the preparation of silkscreens used in the screenprinting process, paper (or other image supports) are coated in a light-sensitive liquid made from a mixture of ferric ammonium citrate and potassium ferricyanide*. This is then exposed, either in a lightbox or in direct sunlight, using objects or images drawn onto transparencies to create a resistance to light in those areas, thereby creating the image in negative. After the paper has been exposed for the required amount of time, it is quickly rinsed in cold water to fix the image. Due to the time available the workshop leader had already prepared the paper by painting it with the photosensitive substance and allowing it to dry. As part of the session we had access to books detailing the work of artists engaged in these practices which we could use to take inspiration for creating our own work. While I was searching the books for ideas I was particularly interested in the botanical images produced by the artist Anne Atkins, as they reminded me of an earlier project that I’d been trying to find a solution for. When working with Museum for the History of Science, Philosophy and Religion, I’d come across a Biblical Herbarium, a 19-century handling collection which taught science through the physical investigation of all the natural materials found in the Bible. 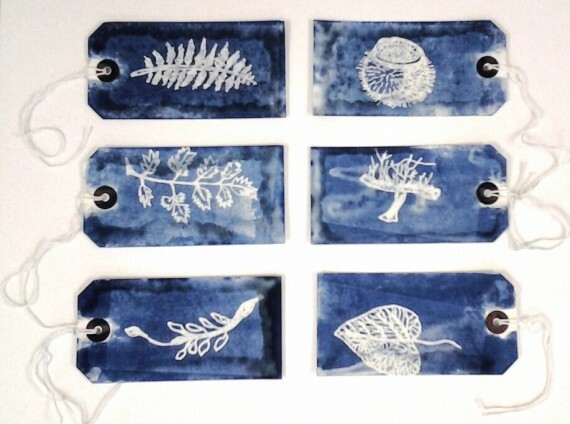 I decided that I would like to create an artist book from this information so I used the workshop to test ways of drawing and transferring botanical images onto luggage tags which I will use later in my practice. Another material I’ve been hoping to use is a roll of paper for making tea bags from, which I acquired from Scrap. However, due to its textured surface and fragile materiality I’ve found it difficult to find a process with which to transfer images onto it. Hopefully cyanotype will be a useful medium for this.